A state-owned company started building "Liquor City" in a suburb of Luliang to help diversify the economy away from coal. 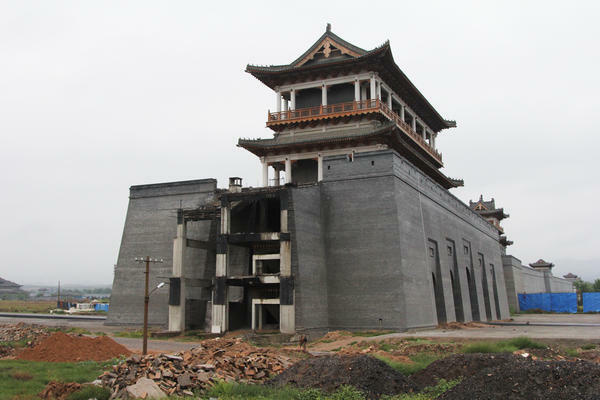 But a massive anti-corruption campaign has damaged demand for expensive Chinese baijiu, or white liquor, and for now, the factory complex remains unfinished. 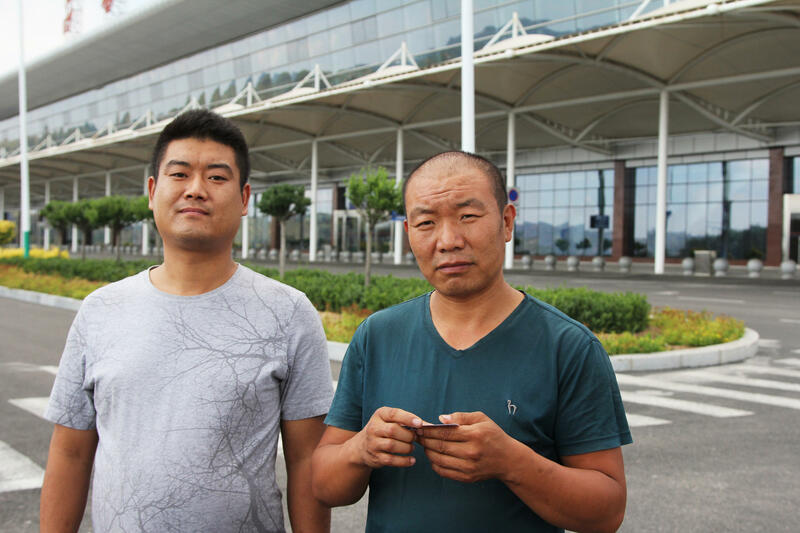 Wu Youfu (at left) and his uncle, Wu Dexi, a farmer, took Youfu's grandmother to visit Luliang's airport, a popular attraction for curious local farmers. It was conceived when this coal city was booming. Now the economy is in recession. When you drive the new expressway to the airport in the Chinese city of Luliang, you are as likely to come across a stray dog as another vehicle. When I recently drove it, a farmer was riding in a three-wheel flatbed truck and heading in the wrong direction. But it didn't matter. There was no oncoming traffic. That's because the city's $160 million airport, which opened in 2014, gets at most five flights a day and as few as three. Officials began building the airport when this coal town was still booming. Since then, though, global commodity prices have plunged as China's old industrial economy has sputtered. The airport has become a white elephant. "Because this place is economically backward, the flow of passengers is small," says Wu Dexi, a local corn and tomato farmer who brought his 78-year-old mother to the empty terminal because she wanted to see an airplane for the first time. "People's income is too low, they can't afford this." No country has built so many roads, bridges and airports as quickly as China. Many projects, including the nation's remarkable high-speed rail network, have had big benefits. But Anne Stevenson-Yang, research director at J Capital Research, an economic research firm in Beijing, says the government has simply built too much. She says lonely airports like the one in Luliang are not uncommon. There's another one northwest of Beijing in Hebei province, in a place called Zhangbei. "It's an impoverished county," Stevenson-Yang says. "They built the airport in order to increase the revenue of the county. But nobody ever agreed to land there." Stevenson-Yang says local officials across China have greenlighted lots of infrastructure projects not because they make economic sense, but just to boost GDP. Now, she says, some are having the opposite effect: They're dragging growth down. "This is why, as fast as China rose economically, this is as fast as it will decline," says Stevenson-Yang. "During the rise, all of these things were accelerating GDP and now they're sitting around as costs." Despite a lot of recent bad economic news, it's important to remember that China's economy is still growing. Projects that sit empty one year can rumble to life the next. 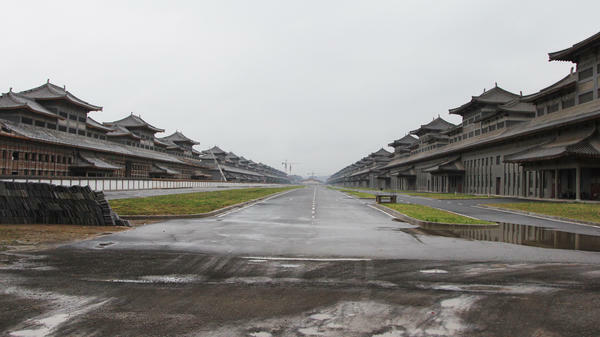 Wade Shepard documents some of the country's deserted new cities in his book Ghost Cities of China: The Story of Cities without People in the World's Most Populated Country. Recently, he took a Russian TV crew to see one outside Shanghai. "We're walking around and — oh, no, all of a sudden, I see cars," Shepard recalls. "There are people!" "Within the 10 months since the last time I'd been there, people had been flooding into this area," Shepard says. "It just shows how quickly these things can change." One project that's unlikely to change anytime soon is Luliang's new "Liquor City." It's a gigantic complex of ancient-style Chinese pavilions covering an area the size of several pro football stadiums, surrounded by an unfinished, life-size replica of the Great Wall. Inside, factories were supposed to pump out tons of high-priced white liquor — called baijiu in Mandarin — for which the region is famous. Baijiu is made from grain, and high-end brands have been a staple at official banquets. As recently as 2012, baijiu sales were a staggering $92 billion. The project was to be funded largely by coal revenues, which collapsed with the drop in global prices. In addition, planners failed to anticipate the Communist Party's anti-corruption drive, the biggest in modern Chinese history. China's leader, Xi Jinping, launched the campaign nearly three years ago, cracking down on lavish spending for which officials have been notorious. "Now things are bad," says Lu Cuie, who runs one of the scores of white liquor stores in town. "High-end liquors don't sell at all. Officials don't buy. No one buys." "On average, when an official held a wedding banquet or birthday party, the banquets used to last three to four days," says Lu, who wears a shirt with the face of Audrey Hepburn emblazoned on the front. "Now, it's simply impossible. It only lasts one day and the scale is much smaller." 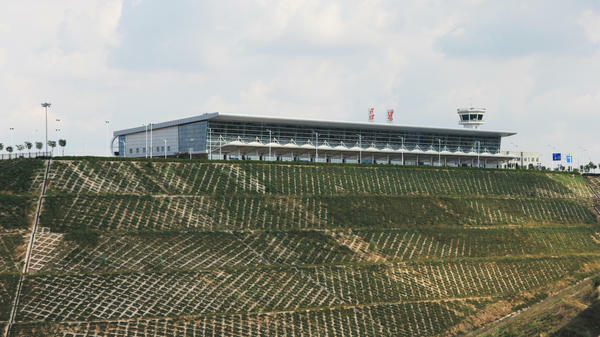 Fenjiu, the state-owned company that's building Liquor City, refused to discuss the project. Lu and other local shop owners say the company is struggling and relies on bank loans to pay employees. When I ran into some managers outside Liquor City's unfinished gates, I asked when it planned to open. They shook their heads wearily and laughed. The news is visible in Jerusalem's physical landscape, the concrete barricades, the soldiers on the streets. The news is just as visible in the physical landscape of China. Chinese authorities have built roads, bridges and airports more quickly than any country. What's really notable now, as China's economy sags, is that much of the new infrastructure is barely used. MONTAGNE: NPR's Frank Langfitt drove around the Chinese city of Luliang. FRANK LANGFITT, BYLINE: We're on the road to the airport. And I've got to say, it's the best traffic in all of China 'cause there is nothing on the road here except stray dogs. In the other lane, there is a farmer in a three-wheeled little flatbed truck. And he's driving in the wrong direction, but it doesn't matter because there's no oncoming traffic. I'm heading into the terminal. Seven check-in counters, and there's absolutely nobody here. It's empty. There's nobody manning any of the desks. It is kind of a ghost airport. A woman eventually appears at a counter. She sells tickets for a shuttle bus that takes passengers into town. UNIDENTIFIED WOMAN: (Through interpreter) The airport opened on January 26, 2014. At most, there are five flights a day. The fewest number of flights a day are three. LANGFITT: I spot an elderly woman in a quilted peasant's jacket. She's not here to catch a flight. Her grandson, Wu Youfu, explains. WU YOUFU: (Through interpreter) I brought my grandmother over to have a look. She's lived for so many years, but she's never seen an airport or an airplane. LANGFITT: Wu, his 78-year-old grandma, and his uncle, Dexi, are local farmers. They grow corn and tomatoes in this poor, mountainous corner of central China. And they've come to marvel at the $160 million airport. But Dexi says plane tickets are beyond the reach of most people here. DEXI: (Through interpreter) Because this place is economically backward, the flow of passengers is small. People's income is too low. They can't afford this. ANNE STEVENSON-YANG: Anne Stevenson-Yang is my name. I work for J Capital Research. LANGFITT: Stevenson-Yang studies China's economy. She says the country has many low-use airports like Luliang's, including one outside Beijing in a place called Jiangbei. STEVENSON-YANG: It's like an impoverished county that - and they built the airport in order to increase the revenue of the county, but nobody ever agreed to land there. LANGFITT: So this is an airport that has no airplanes. LANGFITT: Stevenson-Yang says local officials have green-lighted lots of infrastructure projects just to boost GDP. Now, she says, some are having the opposite effect. They're dragging down growth. STEVENSON-YANG: This is why, as fast as China rose economically, this is as fast as it will decline - because during the rise, all of these things were accelerating GDP, and now they're sitting around as cost. LANGFITT: Though not necessarily forever. Despite all the bad news you've heard recently, China's economy is still growing. And projects that sit empty one year can rumble to life the next. Wade Shepard is the author of "Ghost Cities Of China." Recently, he took a Russian TV crew to see one of the country's deserted new cities. WADE SHEPARD: We get into the streets. We're walking around. And oh, no, all of a sudden, you know, I see cars. There's people. Within the 10 months since the last time I've been there, people started flooding into this area. It just shows, like, how quickly these things can change. LANGFITT: One project unlikely to change anytime soon, though, is Luliang's new Liquor City. It's astonishing, a gigantic complex of ancient-style Chinese pavilions the size of several pro-football stadiums surrounded by a life-sized replica of the Great Wall. Inside, factories were supposed to pump out tons of high-priced white liquor called baijiu, for which the region's famous. Today though, Liquor City looks like an abandoned movie set. Why? The project's planners failed to anticipate the government's anti-corruption drive, the biggest in modern Chinese history. LU CUIE: (Through interpreter) Now things are bad. High-end liquors don't sell at all. Officials don't buy. No one buys. LANGFITT: Lu Cuie runs one of the scores of white liquor stores in town. Before the crackdown, she could sell more than $14,000 worth the alcohol for a single event. That's big money in this coal town of more than 3 million, which has been in recession for nearly two years. CUIE: (Through interpreter) On average, when an official held a wedding banquet or a birthday party, the banquets used to last three to four days. Now it's simply impossible. It only lasts one day, and the scale is much smaller. LANGFITT: Fenjiu, the state-owned company that's building Liquor City, refused to discuss the project. Lu says the company's struggling and relies on bank loans to pay employees. When I ran into some managers outside Liquor City's unfinished gates, I asked when it planned to open. They shook their heads wearily and laughed. Frank Langfitt, NPR News, Shanghai. Transcript provided by NPR, Copyright NPR.